Mint state and key date listed Liberty V Nickel values is for graded, certified and authenticated coins in PCGS or NGC holders. The rest are a sample of raw coin sell but this is not a guarantee your coin with the same date, mint, grade and holder will sell for this exact value. 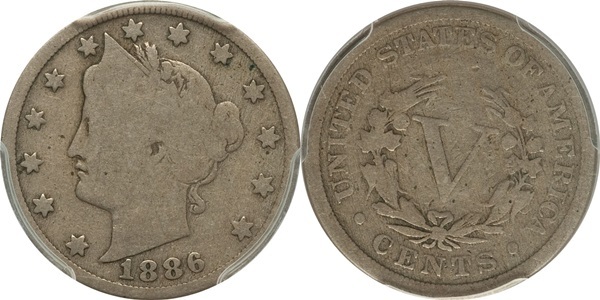 1885 (starts at $400) is the key date of this series and followed closely by the 1886 (value starts at $200) and 1912-S (value starts at $140) and the semi-key dates are the 1883 With CENTS, 1888, 1894 and 1912-D and they start in value from $15 to $20. The exception is the 1912-D, it’s beginning value is under $10 but rises fast as the grade increases. 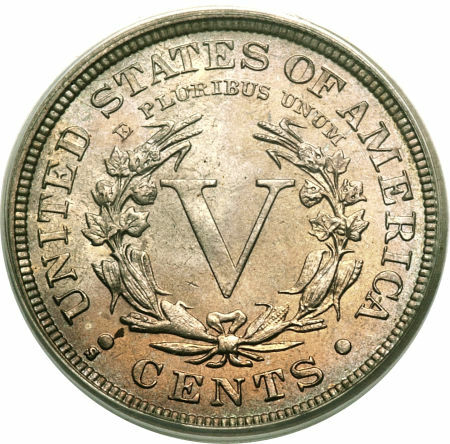 Common date Liberty V Nickel value begins at .50 for any date after 1899; since 1900 through 1912 (without a mint mark) are the highest mintage years. You can get $1 and up for common dates before 1899, but any coin that’s extremely worn or partial and no date will realize less premium. Nick-A-Date (acid date) coins are devalued tremendously even if they’re dated 1885. Liberty V Nickel value in G4 (Good) depends on the date’s mintage and they begin at .50 to a $1, but most examples will be found in lesser grades of AG3 (About Good) and even PO1 (Poor) FR2 (Fair) and are worth less than .50 cents. Key dates are worth much more but if you can find them with at least the last two digits visible or don’t care about an acid date example then you can find a decent bargain. The dates 1909 and 1912-D jump in value for AU (about uncirculated) and the key dates 1885 and 1912-S are worth over $1,500 in AU and with the exception of 1886 and 1885, most dates before 1900 is worth at least $100 in that grade. Dates after 1900, except for the better dates previously mentioned, are worth an average of $60 in the about uncirculated grades. All dates are worth at least $100 in MS (Mint State) grades and anything in MS65 or better is worth several hundred and up to thousands of dollars. Each date has a proof version and they’re worth several hundred dollars and up and the 1913 is rare with only 5 known and it’s worth upward of 4.5 million dollars. Not much in the way of popular varieties but there’s still some valuable varieties to look for; so look for repunched dates (RPD) and doubled dies reverse (DDR). 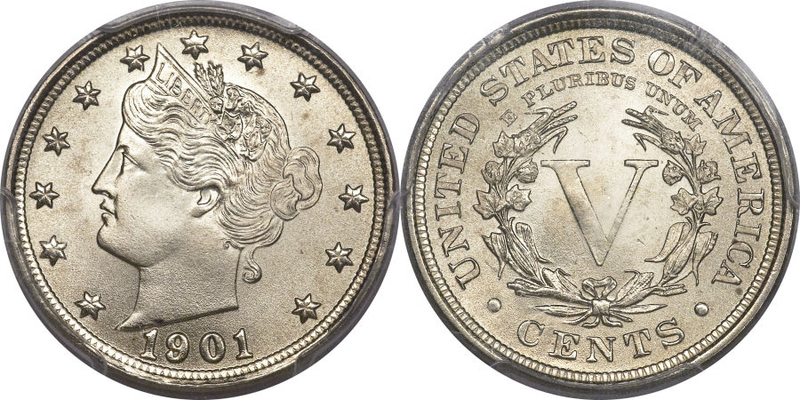 Mint mark: None (for Philadelphia) on the reverse below the button to the left of CENTS, and S for San Francisco Mint and is only on 1912 and D for Denver Mint and only on the 1912 and is a key date of the series. Liberty V Nickel value is determined by grade, condition and date rarity.